This Thanksgiving, I'm oh so thankful for family, for friends, and for pie. I spent my holiday in Minnesota surrounded by food and family (and the kind of signs you just don't see in Manhattan). Below is a recipe for one of the treats that graced our Thanksgiving table (the other, which has become somewhat of a staple around these parts, can be found here). I hope that however you spent your holiday, you had a happy one. Thank you for reading. I'm so grateful that you're here. It's been a while since I've participated in Tuesdays with Dorie, but the group is nearly finished working its way through Baking from My Home to Yours so I figured it's time to get back on the wagon. This week was a "rewind" week, so I made Dorie's All American All Delicious Apple Pie and fancied it up for the holiday by adding some browned butter. Combine flour, sugar and salt in the bowl of a food processor and pulse to combine. Drop the butter and shortening into the food processor and pulse until just combined. Don't over mix the dough--you want pieces the size of green peas. Gradually drizzle about 6 tablespoons of water into the processor, pulsing the machine on and off as you go. Give the machine a few long pulses. The goal here is to sufficiently moisten the dough so that it doesn't look dry, and holds together when pinched. You may or may not need the full half cup of water. Turn the dough out onto a clean, floured surface. It's okay if there are some pieces of butter or flour that don't look like they're incorporated. Divide the dough in half, gather each half into a ball, and flatten each ball into a disc. Wrap each disc in plastic wrap, and refrigerate for at least an hour. (If I am going to leave my dough in the refrigerator longer, say overnight, I slip each plastic wrapped disc into a Ziploc bag to protect against refrigerator odors. Heat the butter in a saucepan over medium-high heat until it is golden, fragrant, and browned bits have formed. (Watch the butter carefully as it burns very easily.) 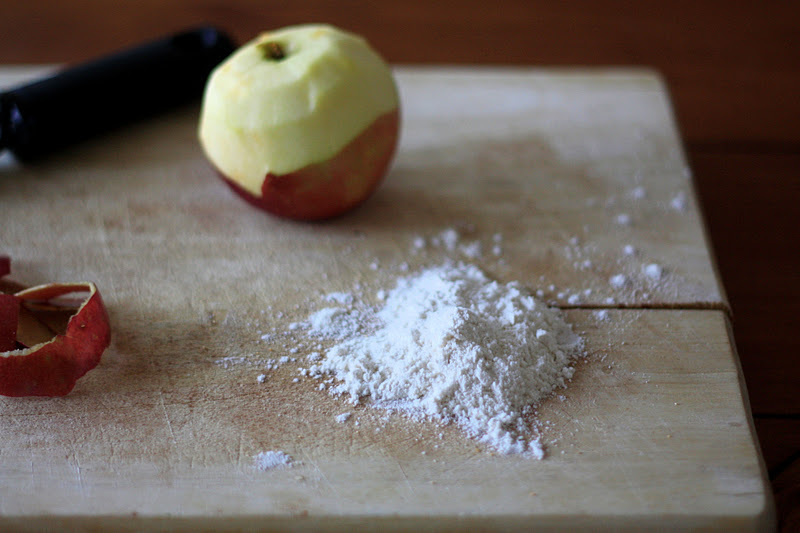 In a large bowl, combine the apples, sugar, cinnamon, salt, tapioca and graham cracker crumbs (you can crush a few crackers with your hands or the back of a knife, or pulse them in a food processor). Pour the brown butter over the apples, stir, and allow the filling to sit while you roll out the dough. *Note: Dorie sprinkles the cracker crumbs over the bottom of the pie dough before spooning the filling on top of it in order to keep the crust from getting soggy. I forgot and mixed the crackers right into the filling. If you try it her way, let me know what you think! **Note: The original recipe included the zest of one lemon, but I used the only lemon at my parents' house the night before in a hot toddy. Oops! Remove your dough from the refrigerator, and let it stand for a few minutes at room temperature. You want your dough to be cold, but not so stiff that it will crack and tear when you try to roll it out. Place one disc of dough on a clean, floured work surface. Sprinkle some flour on top of the disc of dough and on your rolling pin. Working from the center of your disc of dough, roll the dough out towards the edges. Every few rolls, turn the dough in a clockwise direction to prevent it from sticking to the countertop. When your dough is about 1/8 inch thick and large enough to fit in a 9-inch, deep dish pie plate, position the pie plate behind your dough, place your rolling pin in the center of your circle of dough, and fold the back half of your dough over the rolling pin. Holding onto the pin, quickly and carefully lift the dough into the pie plate. 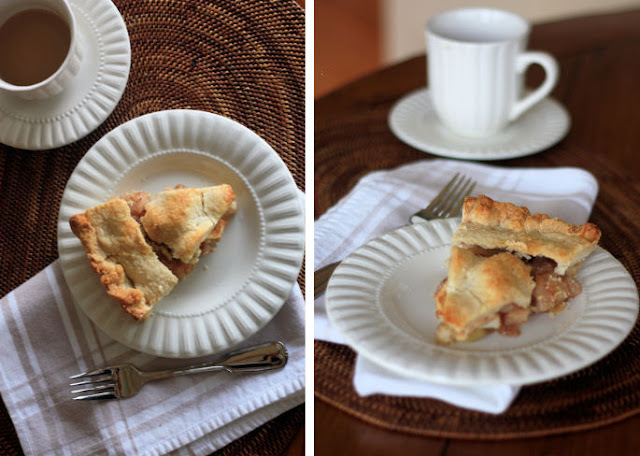 Gently press the dough down into the pie plate, and use a kitchen scissors to trim the edges. Roll out the second disc of dough in the same manner as the first. Spoon the filling into the bottom crust (the filling will mound up over the top of the crust). Lightly moisten the edges of the bottom crust with a bit of water, and place the top crust over the pie. Press the top crust and bottom crust together, and crimp the edges to seal using your fingers or a fork. Preheat the oven to 425 degrees. Using a sharp knife, cut several steam vents in the top of the crust. Brush the top of the pie with heavy cream, and sprinkle it with sugar. Bake the pie for 15 minutes at 425, then lower the heat to 375 and continue cooking for 50-60 minutes, until the crust is brown and the juices are bubbling. Cool on a wire rack before serving. 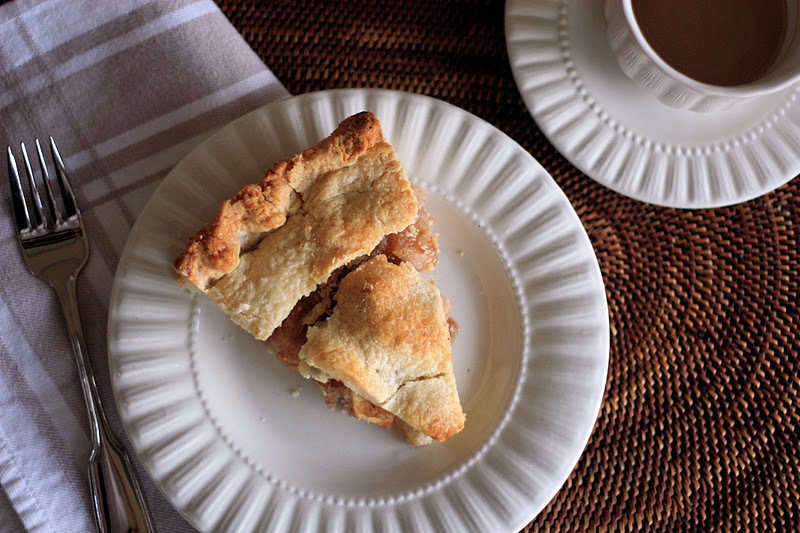 Your apple pie looks divine - pretty photos also. always love waking up to the smell of burnt butter. Better when its with apple pies like yours! that looks so nice. 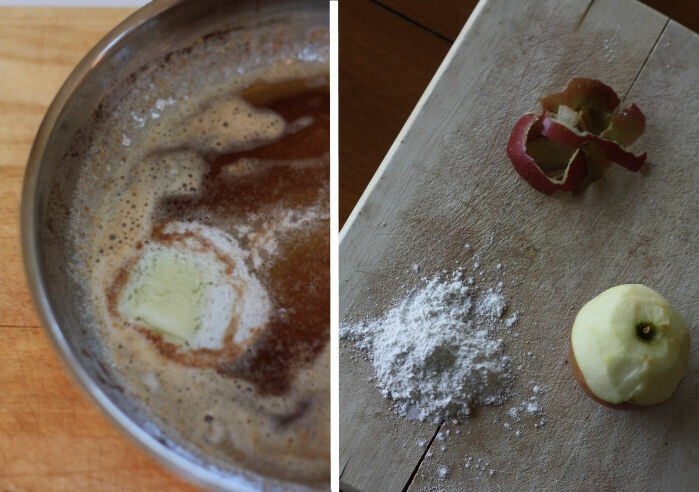 and browned butter makes everything tastier--great idea! I over-lemoned my mini pie this year, so I feel like you didn't miss much. The brown butter sounds amazing.